Isn’t this the most gorgeous lunch bag ever? I hugely advocate packed luckes. As a budgeting mama I know you can save a fortune not buyng lunches out. Usually I use old tupperware at the bottom of my handbag to cart my lunch about but I was recently sent these items to review and I just had to show you. Take a look at this gorgeous lunch tote bag from Built: it retails from £25 and is avilable from John Lewis and Amazon. It can insulate your food for 4 hourswhich is very useful. It is stain resistant, washable and looks great which is an added bonus but one that means I am definately more likely to use it. I have used mine a lot and whilst it is WAY dearer than an M&S carrier bag I do adore it and it keeps your lunch so fresh! 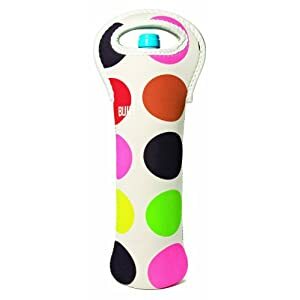 I also reviewed a dotty spotty drinks holder from Built NY whcih comes in a range of cool designs and either wine bottle or small water bottle size. So cute and again these keep your drinks nicely cold or hot for up to 4 hours. It can be clipped on your belt or backpack as the Lamprey Velco Snap will stay secure. Machine washabe, stain resistant and drip dry and it also stores flat. These range form £6.99. Luxury lunch bags could be considered an investment buy!